Hi everyone! 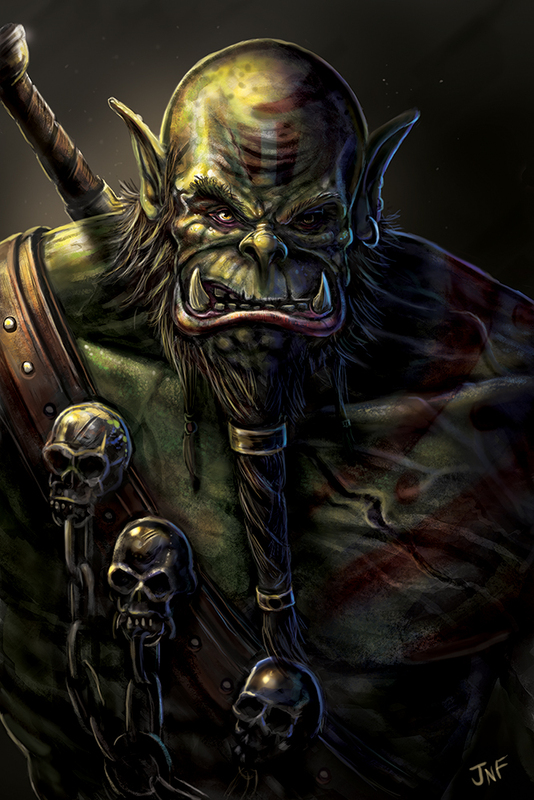 I’ve just painted this Warcraft inspired Orc… In dual part due to discovering a couple of cool things! I downloaded some digital art tutorials and listened to illustration podcasts. Dave Rapoza’s Bog Witch Part 2 was the video I chose to watch (I’m still about half way through!) and I stated listening to Chris Oatley’s podcasts. Both have been integral for inspiring me to make more time for personal art. Due to a high level of client artwork I’ve really dropped off, but this week I’ve been back with a boom. I LOVE IT. I decided to do a portrait of an orc, a classic fantasy character and something really close to my heart. As a kid Orcs and Goblins were my favourite fantasy race in the Warhammer world. I also loved playing World of Warcraft in my late teens/early twenties, so I wanted to see if I could master some art like some of the unbelievably good fan art you can find online. I’m really proud of the outcome! For the Horde! So I have decided I’m going to try and record my own tutorials to help me understand my own process. It also makes me work a little quicker I think. While I haven’t done a full digital art tutorial yet, I have made a very quick sped up video of my process here. Please consider subscribing to my channel as I’ll be uploading more as I progress.